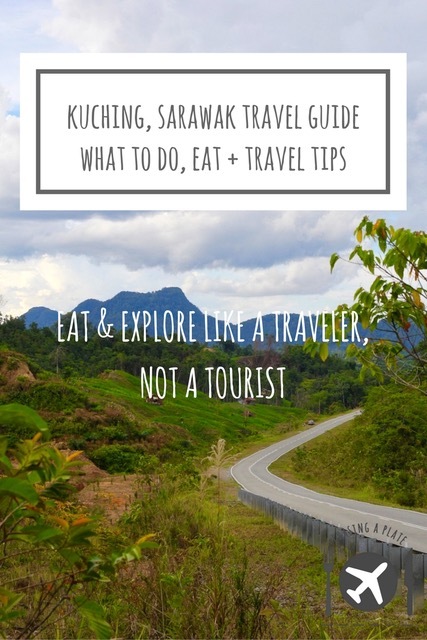 Disclaimer: Chasing a Plate’s visit to Kuching, Sarawak was sponsored by Sarawak Tourism. All opinions are our own. This post contains affiliate links, thank you for supporting our blog by using these links. A visit to Kuching is incomplete without a trip to Semenggoh Wildlife Centre. 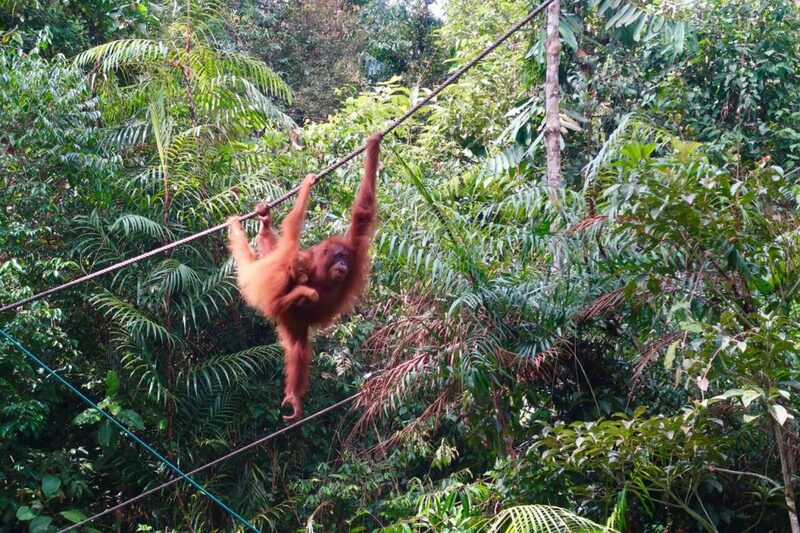 The orangutan here have been rehabilitated and trained to fend for themselves in the surrounding forest reserve. But the semi-wild orangutan often still swing through the jungle canopy each morning and afternoon to help themselves to a smorgasbord of fresh fruit. Join the hushed crowds with their faces tilted upwards and marvel at the agility, personality and strength of these great apes. 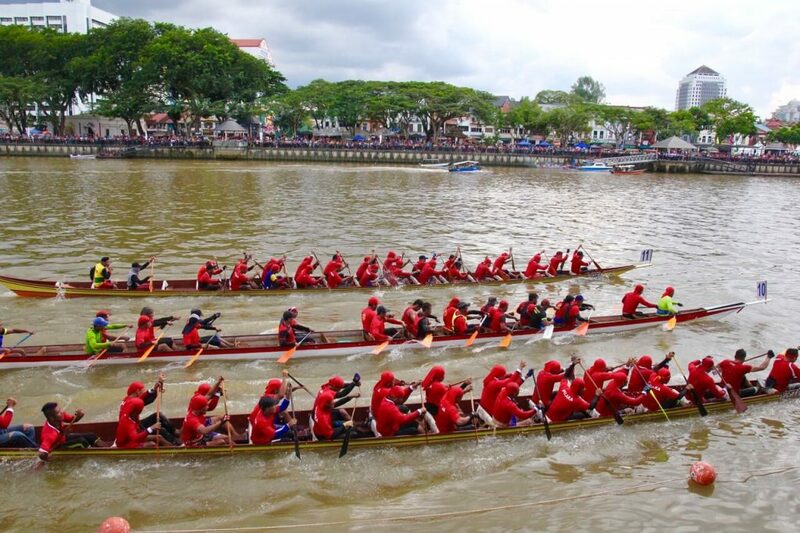 If you happen to be in town during the annual Sarawak Regatta you must join the lively crowds along Kuching’s waterfront. The event is steeped in history and dates back to 1872 where it began as a means to end racial tensions between warring headhunting tribes. James Brooke, the first White Rajah of Sarawak, challenged the tribes to battle their differences out on the river through a boat race thus bringing harmony to the area. 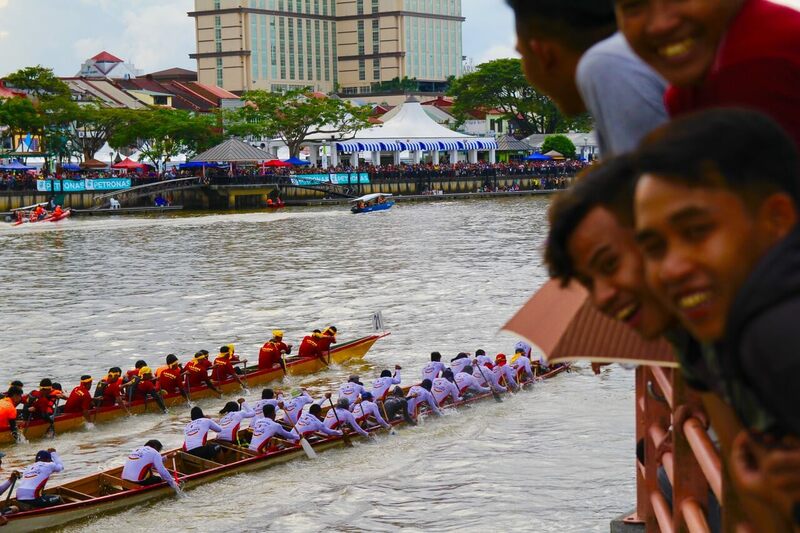 The tradition has continued and each year teams compete furiously on the water to take home the title of ‘Rajah Sungai’ (King of the River). The waterfront itself transforms with locals erecting tents and selling street food to the hungry crowds. It’s easy to escape into the wilderness from Kuching. Soaring limestone and lush jungle can be discovered via a kayak along Semadang River. It’s a peaceful way to spend a few hours- the paddling is gentle and there are opportunities to cool off along the way. You’ll stop halfway for lunch at a village along the river. Featuring local specialties like manuk pansuh- chicken cooked in bamboo over fire and cangkuk manis- sweet leaf tossed with egg, it’ll set you up for another stretch of kayaking. 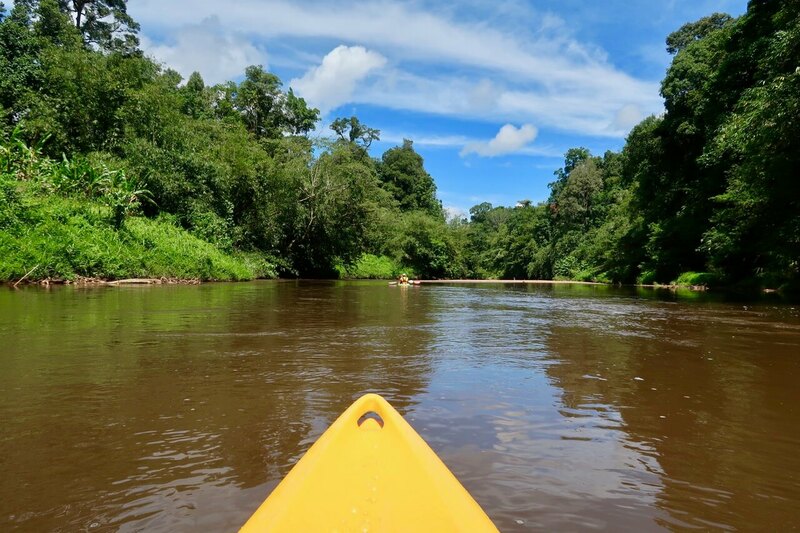 The distant squabble of monkeys, the incessant chirp of crickets and the gentle flow of the river catapults you right into a Borneo jungle experience. It won’t take you too long to realise that Sarawak is a state rich in history and culture. With a diverse population made up mainly of indigenous ethnic peoples, Malay and Chinese- Kuching’s many museums will help you understand the unique cultural identity of Sarawak. The Sarawak State Museum is a good starting point- it’s well curated with succinct and easy to understand exhibits that guide you through Sarawak’s history, the religious beliefs of its population and tribal practices of some of its indigenous peoples. The Chinese History Museum and Textile Museum are both worth some time also. A tiny Chinese village located around 20km outside of Kuching, Siniawan comes alive over the weekend when it holds its Night Market. 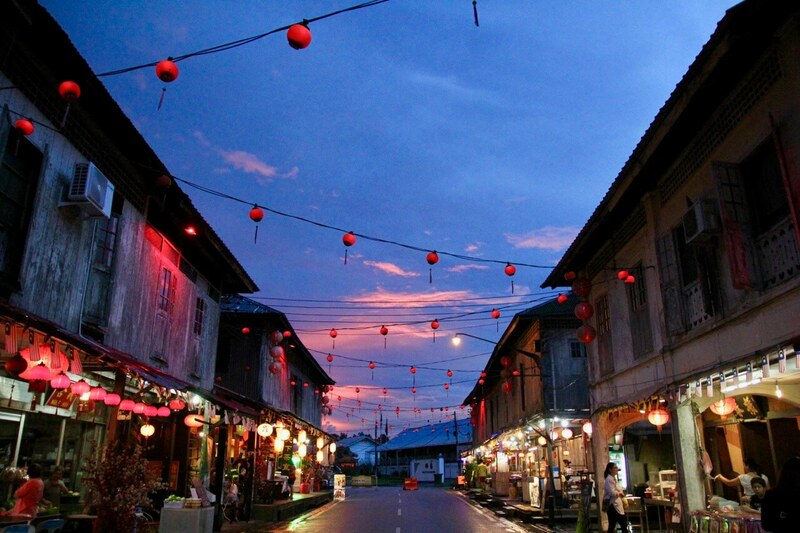 It’s impossible not to fall in love with the Old Siniawan Bazaar- its charm lying in its wooden shophouses and the soft glow of the Chinese lanterns strung up the length of the street. Street food vendors line the pavement- sticky barbecue pork, traditional kueh (Malaysian snacks or sweets), smoky satay- you won’t go hungry here. Don’t forget to poke your head into some of Siniawan’s shops, most of which are stuck in a time warp- old records, dusty shelves lined with cosmetics reminiscent of the 80’s, faded vintage glass bottles- if you love a bit of nostalgia, Siniawan is a must visit. The best way to see any city is to spend some time discovering it on foot. Kuching’s centre is very walkable and at every turn there’s an interesting museum to discover or a hawker tossing together a dish you just have to taste. Start in old Kuching and wander around the Main Bazaar and Carpenter Street area. Take in traditional Chinese shophouse architecture where many families still retain thriving tin-smithing and sundry trading businesses. Stroll along Kuching Waterfront and admire the grand Parliament building and view of the river from the newly built Golden Anniversary Bridge. Don’t forget to hop on a local boat (RM 1/$0.25 USD) over to Kampung Gersik, a Malay village which houses a number of Kek Lapis (layer cake) shops to purchase one of Sarawak’s most famous foods! Your Kuching eating itinerary would be incomplete if it didn’t include Sarawak Laksa. Created in 1945 by a Teacher immigrant, this addictive bowl of noodles is made up of rice vermicelli, gently poached chicken and prawns and beansprouts. What makes it really special though is the broth the ingredients wallow in. A chicken and prawn stock which is redolent with fragrant coconut milk and a long list of spices and aromatics including ginger, lemongrass, cloves, galangal and chilli. This is one bowl of noodles you cannot miss. 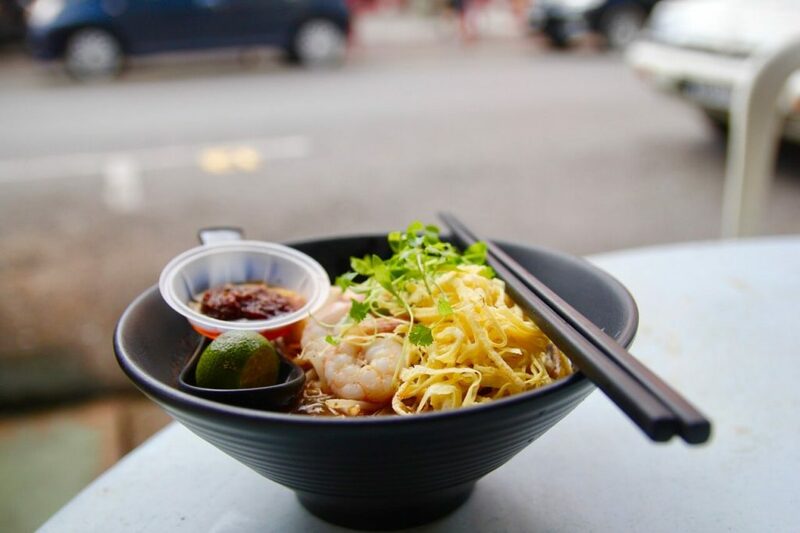 Sarawakian Chinese culture is perhaps the most evident in the dish kolo mee. Springy egg noodles are drizzled with pork lard and shallot oil before the glistening noodles are topped with slices of char siew (barbecue pork), minced pork and spring onions. On the surface it seems pretty basic but the depth of flavour the shallot oil and pork lard creates will see you returning to this breakfast dish time and time again. 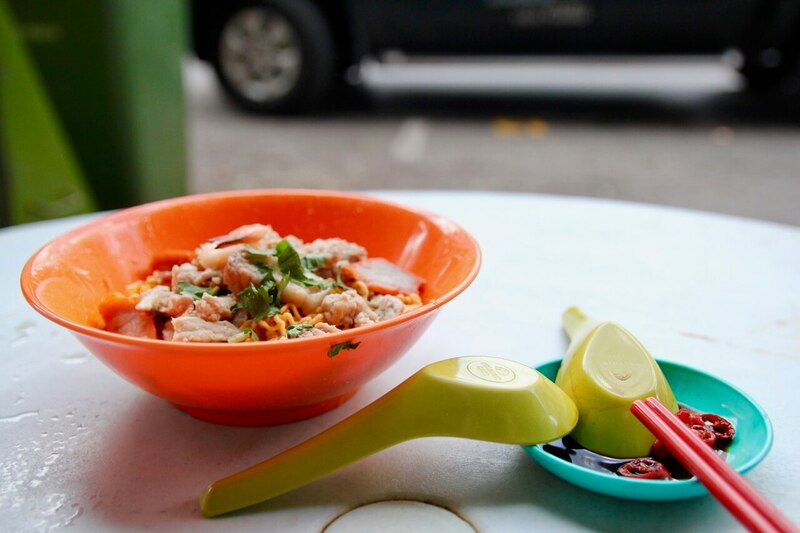 Make sure you try the red kolo mee also, where a drizzle of the char siew oil coats the noodles in a sweet, red sauce. Sarawak celebrates a strong indigenous culture and what better way to learn more about the different tribal groups than through food? 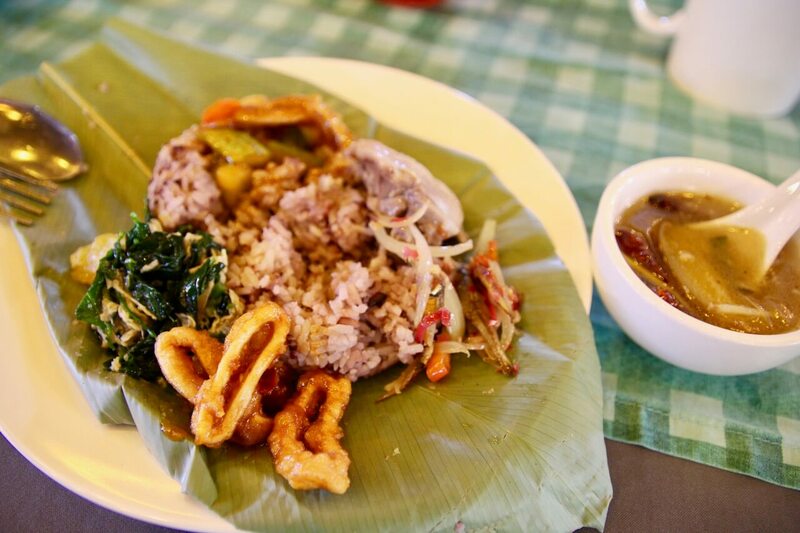 Dishes not to be missed include manuk pansoh (chicken cooked in bamboo) which sees pieces of chicken cooked in bamboo over fire together with aromatics like ginger, torch ginger flower and lemongrass and midin belacan a jungle fern cooked in a fermented shrimp and chilli paste. We found the indigenous dishes that we sampled to be unique and incredibly delicious. 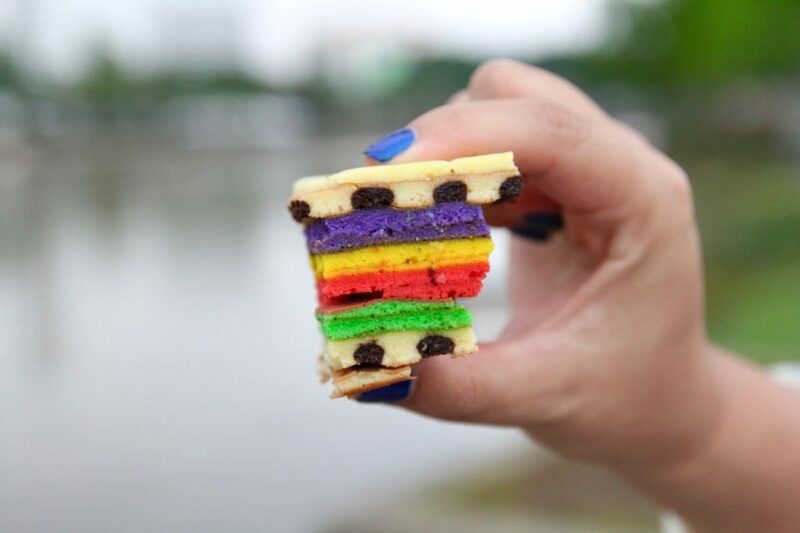 Sarawak is famous for its Kek Lapis or layer cake which is often served on special occasions. Visitors to Kuching purchase these elaborate and colourful cakes by the box load- a piece of the the butter cake along with a kopi (Malaysian coffee) making the perfect afternoon tea. You’ll find all kinds of flavours including durian, mint, blueberry, pandan, coffee and more. We suggest you head over the river to Kampung Gersik, a Malay village which has a number of Kek Lapis shops to purchase your stash! Another popular Sarawakian Chinese dish which must be tried if you’re into offal. Tender braised pork together with pig’s intestine, skin and ear are served in a herbal, soy broth with slippery rice noodles, soy braised eggs and fried tofu puffs. Dip the pork in the accompanying chilli oil for a bit of a kick. A hearty, satisfying dish. Head to a local’s hot spot for a seafood feast. Top Spot, located on top of a car-park building is a food centre housing a number of different seafood restaurants. Each allow you the opportunity to pick your own fish from the vast selection of seafood on offer- think blood cockles, squid, stingray, gigantic river prawns- you name it, they’re likely to have it. Don’t forget to order local vegetables to accompany your meal like midin belacan (jungle fern) and cangkuk manis (sweet leaf). A lively atmosphere and fresh seafood will make for a brilliant dinner out. Food centres are an excellent way to dine in Malaysia- they can’t be beat when it comes to variety and affordability. Food centres house a number of different stalls all selling a different dish. 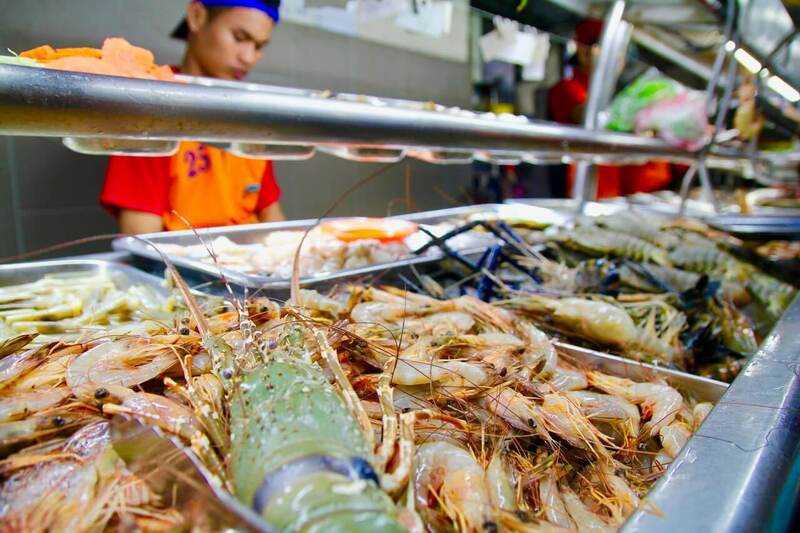 Just outside of Kuching city centre is 101 Food Centre which features an array of local food. Think grilled chicken wings, kolo mee, satay, grilled stingray, dumplings, laksa- to name but a few. 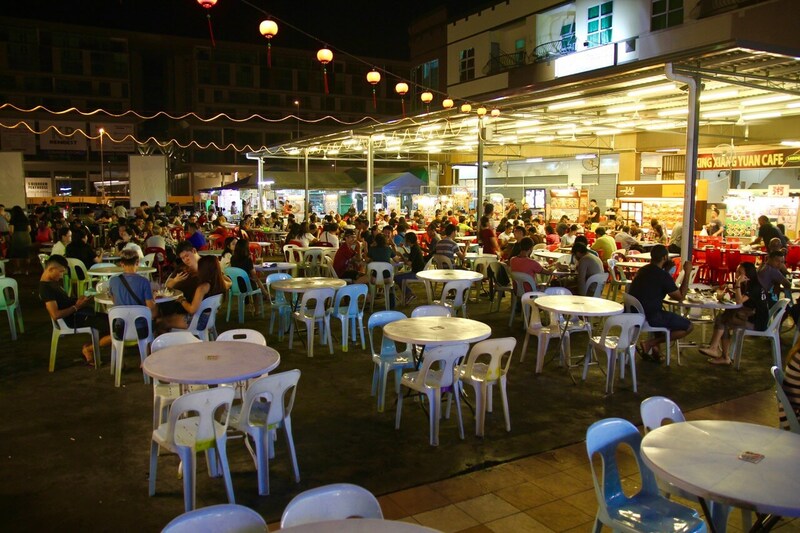 The casual yet lively atmosphere and local food makes food centres a great option when looking for a place to eat. If you’re basing yourself in the city centre, walking is the best way to discover Kuching. Attractions are within easy walking distance of each other. If you need to travel a little further afield, Uber and the local equivalent Grab are a really convenient and affordable way of getting around Kuching. And if you’d rather just let someone else do all the organising for you when it comes to visiting Kuching’s local attractions such as a trip out to Semenggoh Wildlife Centre we recommend the team at CPH http://www.cphtravel.com.my. No matter where you’re travelling to we always recommend you have travel insurance. We use and love World Nomads. The great thing about them is that you can purchase travel insurance while you’re already travelling! Yes, love this! Got some awesome places and stuff in this guide to Malaysia, especially Kek Lapis, which is just SO good!! You two among my fav food advanturers. I am originally from Malaysia now I live in Boston , Massachusetts. You guys went around Malaysia and tried so many kind of Malaysian foods. You are braved, advanturers and enjoying Malaysian foods from the streets and to kampung as well. Way to go you two and keep up the good job and keep on uploading new videos about Malaysian foods especially in the kampung areas. Thanks a million for exposing our Malaysian foods through out the world because not many people know about Malaysian foods. ps I missed home but when I watched you video it brings back memories. I really enjoyed my stay in Kuching last year. Although this place is a bit boring, the ambiance is quite relaxing. Thanks so much for your sharing!